Purpose: Confidence, self power, name and fame. For those in service , business and politics who wish to command and control other people effectively and earn appreciation. 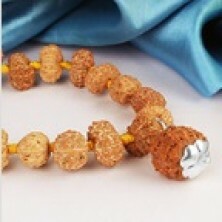 12 mukhi Rudraksha represents Lord Sun. The wearer gets limitless administrative capacity. He gets the quality of the sun - to rule and to move continuously with brilliant radiance and strength. Increases self image and motivation and releases worry, stress, suspicion, anger, low self esteem and feeling of victimization. Helps in digestive disorders, acidity, hypertension and liver ailments. Design: Made of of 12 mukhi java rudraksha.